I’ve recently returned from a short holiday in London where I was able to spend a couple of hours at the Science Museum in South Kensington. This was my third visit to the Museum but the previous two visits were hurried attempts to cover the entire Museum as quickly as possible so this was my first opportunity to take my time and concentrate on examining the Museum’s fine collection of computer-related exhibits in the Computing Gallery. The highlight of the collection is probably the full-scale replica of Charles Babbage’s Difference Engine No. 2 which contains over 8,000 components and weighs 5 tonnes. Seeing this mechanical marvel up close really brings home the astonishing achievements made by Babbage more than a century before the birth of the computer industry. Other Babbage items on display include the trial model and some of the engineering drawings for the Analytical Engine, Babbage’s general-purpose programmable calculating machine which was never built. These provide a poignant reminder of a lost opportunity and food for thought on how much more advanced computer technology would have been had Babbage succeeded in completing this incredible machine. I was pleasantly surprised to see one of Jesse Ramsden’s circular dividing engines on display. Ramsden’s work on scientific instruments and machine tools in the 1770s led to major advances in precision engineering. 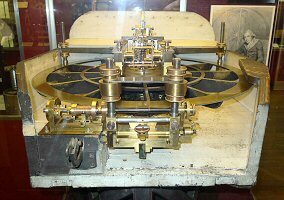 These advances not only allowed Babbage to create the intricate mechanisms for his Engines but they also provided the foundation for the successful mass production of mechanical calculating machines in the latter part of the 19th century. The Museum’s collection does an excellent job of covering the mechanical and electromechanical eras and it was reassuring to see analogue computing well represented. The electronic age is less well represented, however, with only a handful of medium and large scale electronic computers on display. I’m aware that the Museum has many more items in storage than it can possibly display in the space available but it would be good to see a few more examples of electronic computers from recent times. Unlike many of London’s tourist attractions, entry to the Science Museum is free. Despite visiting at the height of the tourist season, there were no long queues at the doors, possibly as a result of stiff competition from the Natural History Museum and Victoria & Albert Museum which are both located in the same area. If you are ever in South Kensington and have an hour or two to spare, I would highly recommend a visit. If not, you could try reading Chapter 1 of my book which covers the work of Jesse Ramsden and Charles Babbage. This entry was posted in Uncategorized and tagged Charles Babbage, Jesse Ramsden, Science Museum on 14/08/2013 by Stephen J Marshall.